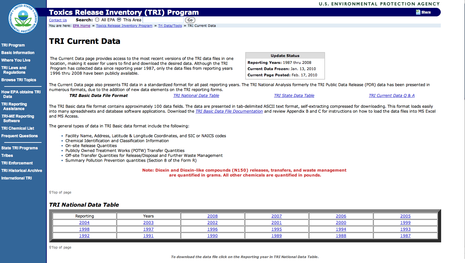 The Toxics Release Inventory (TRI) is a publicly available database containing information on toxic chemical releases and other waste management activities in the United States. The database is available from the United States Environmental Protection Agency (EPA) and contains information reported annually by certain industry groups as well as federal facilities. Each year, companies across a wide range of industries (including chemical, mining, paper, oil and gas industries) that produce more than 25,000 pounds or handle more than 10,000 pounds of a listed toxic chemical must report it to the TRI. The TRI threshold was initially set at 75,000 pounds annually. If the company treats, recycles, disposes, or releases more than 500 pounds of that chemical into the environment (as opposed to just handling it), then they must provide a detailed inventory of that chemical's inventory. The inventory was first proposed in a 1985 New York Times op-ed piece written by David Sarokin and Warren Muir, researchers for an environmental group, INFORM. Congress established TRI under the Emergency Planning and Community Right-to-Know Act of 1986 (EPCRA), and later expanded it in the Pollution Prevention Act of 1990. The law grew out of concern surrounding Union Carbide's releases of toxic gases in the 1984 Bhopal disaster and a smaller 1985 release in Institute, West Virginia. The Pollution Prevention Act of 1990 requires the Environmental Protection Agency to establish an Office of Pollution Prevention, develop and coordinate a pollution prevention strategy, and develop source reduction models. The act requires owners and operators of manufacturing facilities to report annually on source reduction and recycling activities, and authorizes EPA to collect data collection on pollution prevention.